Solar awareness amongst rural masses. Assist domestic/residential/Non Profit Organization/Education institutions to avail Govt Subsidy @30% of whole project or Rs.20,000/- per kWp whichever is less. Asses roof site to analyse feasibility of installation of Rooftop Solar Power Plants. 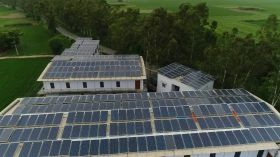 Solar PV Plant design: Grid Tied Roof top or Ground based solar PV Plant, Off Grid Rooftop or Ground based solar PV Plants with Battery Bank design, Hybrid Rooftop or Ground Based Solar PV Plant with Battery Bank. Project planning, budgeting and identification of the resources needed. Plant Engineering and Design based on Architecture drawings of the site. Solar PV plant energy yield estimations over the entire period of the plant life.